This ground-breaking series is a comprehensive history that traces the "Presidential line” of the Washingtons. Volume one begins with the immigrant John Washington who settled in Westmoreland Co., Va., in 1657, married Anne Pope, and was the great-grandfather of President George Washington. Unfortunately, due to sales rights restrictions, we cannot offer The Washingtons: A Family History for sale in your country. This ground-breaking series is a comprehensive history that traces the "Presidential line” of the Washingtons. Volume one begins with the immigrant John Washington who settled in Westmoreland Co., Va., in 1657, married Anne Pope, and was the great-grandfather of President George Washington. It continues the record of their descendants for a total of seven generations. 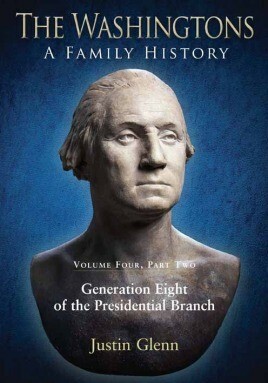 Volume two is a collection of notable descendants of the next eight generations of John and Anne Washington's descendants, including Gen. George S. Patton, author Shelby Foote, and actor Lee Marvin. Future volumes trace generations eight through fifteen, making a total of more than 63,000 descendants. Although structured in a genealogical format for the sake of clarity, this is no barebones genealogy but a true family history with more than 1,200 detailed biographical narratives. These, in turn, strive to convey the greatness of the family that produced not only The Father of His Country but many others, great and humble, who struggled to build that country. The Washingtons includes a special volume on the time-honored John Wright line, which in recent years has been challenged largely on the basis of DNA evidence, and another on the royal descents of the presidential line. A cumulative index completes the series.